How to shoot Fireworks ? There are many exciting scenes around you that you can take photos of. You can take photos of wildlife, sports actions, nature, or portraits of your friends and family. However, one of the most exciting scenes to capture on your DSLR is a fireworks display. Here are some tips and camera settings for capturing picture perfect fireworks actions. Get to the location a bit early and try to collect information on fireworks display timing, set up & from where the fireworks will be coming from. Find the right place with a nice foreground & background view to position yourself, and take a few photos to get a feel of the focus. You will need to be quick in focusing, especially if the fireworks display is not going to last very long. 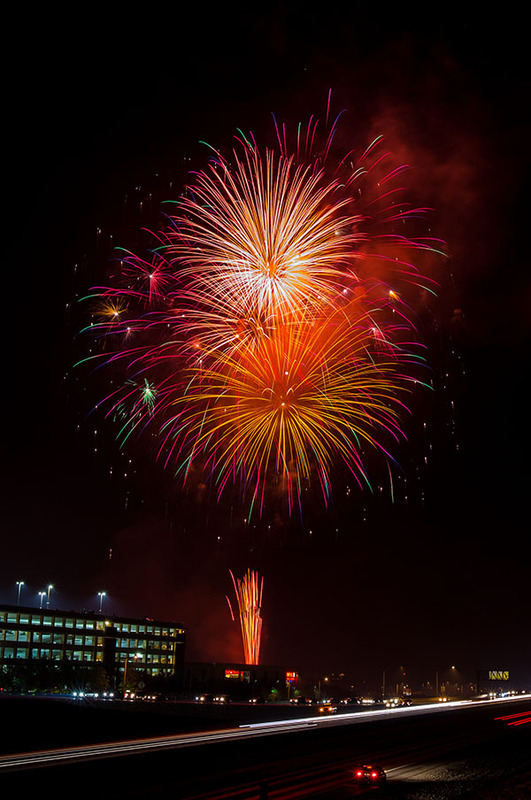 A regular lens will do when you’re taking fireworks photos, so if you’re new to photography and haven’t purchased a wide variety of lenses, don’t worry because the lens that your DSLR came with will be just fine. You don’t need a fast lens to shoot Fireworks. Remember, you are shooting bright light (fireworks trails), not the dark (sky). Zoom lenses are flexible & they make it easier to compose. A good quality tripod is a must for fireworks photography. The beauty of fireworks photography is in capturing the light trail or blurr of the fireworks. To achieve that a long shutter speed (4-10 sec) is required. To keep the camera totally still & shake free for that long exposure a tripod will be very useful. Bulb mode is the best for fireworks photography. So, a remote release would also be very useful. However, if you don’t have a tripod with you, you can make do with something sturdy that you can brace the camera on. You will be shooting from a good distance from the actual fireworks display so you shouldn’t have much trouble finding something sturdy. The top of your car, or any other car, asteel railing or a fallen tree will do. Anything sturdy that you can use will do. Focus manually. One tip on setting your focus settings early is to pick an object about the same distance as the fireworks.This is why it is important to know exactly where the fireworks will be coming from. Once you have a good idea of the distance, you can set you focus to an object approximately the same distance. When the actual fireworks display starts, you will already have your camera focused. For your exposure settings, it would be good to set aperture to f/8 to f/16. Confused because you’ll be shooting in the dark? Don’t be because you may be shooting in the dark but your target will be pretty bright. Best setting for fireworks photography is “Bulb”. To catch motion blur of fireworks 4-10 sec long shutter speed produces the best result. For that “bulb” setting & a remote provides more control. Well, if you dont have a remote or cable release use your camera’s self timer. You will also want to use ISO 100 to keep down the noise as much as possible. Fireworks photographs are great if taken without too much noise and an ISO setting of 100 keeps down that noise as much as possible. Once you’ve taken the first shot, take a short moment to analyze the photo so you can adjust your settings accordingly. You will most likely have taken quite a number of shots on your first try so you can capture the burst and not just the rocket going up. Quickly move to the frame where you captured the burst and analyze it. Apply the Rule Of Thirds if possible. Avoid too many burst in a single frame. Early part of the display is the best for shooting fireworks. Later the sky becomes cloudy & hazy. Fireworks photography is actually pretty simple, the only thing to really be aware of is to keep the camera very steady. Plan ahead so you can bring a tripod with you, but if you don’t have one and need to take the photos with the camera in your hands, make sure that you find a sturdy spot to brace yourself against.